Last Saturday I gained an insight into what London might feel like without cars. 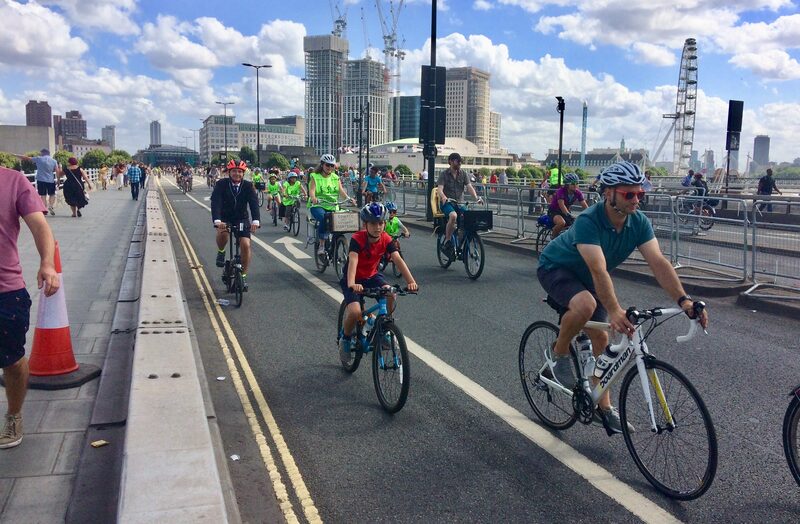 As part of the Ride London festival, Waterloo Bridge (pictured) and other roads round the city centre were reserved for cyclists. It was strange to walk along the Strand and hear only the sound of chatter and spinning wheels. For cyclists, the idea was to allow them to enjoy the freedom of riding through a traffic-free city. Perhaps it was a bit like the ‘incredible feeling of freedom’ that comedian Mark Thomas recalled having on his first Critical Mass ride in 1999. The experience – and the soundscape sans combustion engines – is captured beautifully in this 10 minute Radio 4 Short Cuts feature. It starts 19 minutes 30 seconds in. Listen with headphones on and you’ll feel as if you were there with him.